It has been more than a month since I got back from New York for fashion week and I still can't believe it! It has been my dream to attend NYFW since I was kid, a dream that a little girl from Colombia never thought would come true, and to actually be there was beyond amazing! I thought I would share some of those crazy and amazing moments in this post. 1. Going backstage at the Creatures of Comfort show This was my first show of the season and also my first backstage so it felt surreal when I actually got there and saw the models, the hair & makeup station, the E! News team filming a segment. It blew my mind a bit that not only was this my first show at NYFW, but I had been granted backstage access!! This was also my favorite show, the styling was amazing and I left super inspired. 2. Seeing Bella Hadid at the Jason Wu backstage Was listening to the the styling info from the Tresemmé hairstylist and recording an Insta Story, when I notice that 50cm away from me was Bella Hadid sitting while they did her hair. Stared like a loser with my mouth open (imagine the other 4 people with me doing the same lol) until she noticed and then I felt embarrassed. 3. Going to the Maybelline Content Studio Being able to go to the Content Studio for Maybelline was incredible! I got to see some of the studios where they filmed many things and a few of the new releases coming to Colombia had me súper exited! Plus I found my new favorite lip color. 4. Having 30 photographers take our picture when crossing the street That title makes it sound like I was a badass, but no, sadly that was not the case. Me and Aga were running late to our Tresemmé hair appointment so we were doing that funny looking run-walking thing that you do when you are late to something, when we saw a model (or at least we thought she was a model) who was crossing the street and having her picture taken by a lot of photographers. We thought she must be famous and that's why they were taking her picture, we crossed the street after she was finished thinking the photographers were done, but no, 30 cameras (30, 15 or 50, but it was a lot) turned towards us. The panic in our faces and walk must have been a beauty to watch! 5. Shooting a Campaign with Falabella Being able to shoot a campaign with them for my blog and Instagram was a dream! They are such a large brand and they only work with the best, so getting to work with them was incredible, plus those pictures might be my favorite ones from the trip. 6. Meeting Michelletakeaim randomly on the street I am the biggest Michelletakeaim fan ever! Her pictures are always part of my moodboards and I just love her entire feed so much. I was actually taking a picture of a friend as we were getting in to the car that was taking us to the Tresemmé global event when I saw Michelle, I practically threw my friend's phone back at her while I ran to say hello to Michelle. She had shared my instagram on her #takeaim Insta Stories and had messaged me on DMs a few months before so when I mentioned it she was so sweet and nice, it literally made my day! 8. Having dinner with the global Tresemmé influencers You know those brand dinners that you see all your favorite influencers going to? This was exactly like that, I felt like I was in a dream. Everything was so beautifully decorated, the other influencers were amazing and the experience incredible! Plus finishing the evening at the rooftop with the perfect view of Manhattan while having cocktails and dessert was amazing. 1. Estar en el backstage de Creatures of Comfort Este era mi primer show de la temporada y también mi primer backstage y fue una locura llegar y ver a las modelos, la estación de pelo y maquillaje y el equipo de E! News grabando para el show. 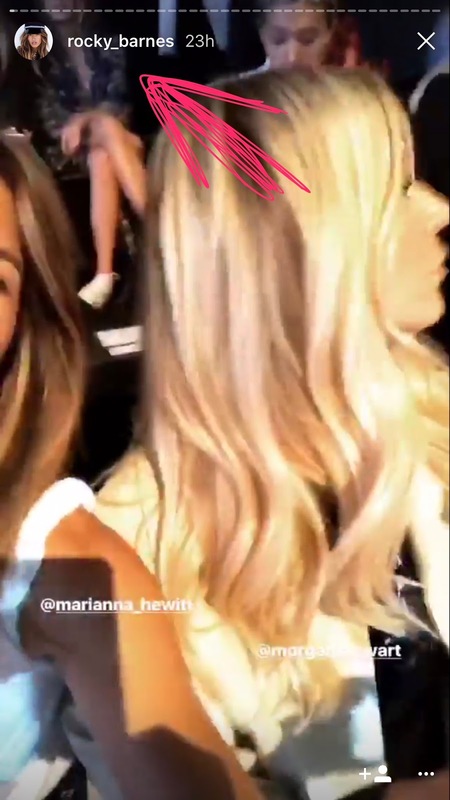 Fue increíble que no solo era primer show de NYFW, pero me habían dado acceso al backstage!! Este también fue mi show favorito, el styling era espectacular y salí súper inspirada. 2. Ver a Bella Hadid en backstagede Jason Wu Estábamos escuchando la información de styling de la estilista de Tresemmé, cuando me di cuenta que a 50cm de mi estaba Bella Hadid sentada mientras la peinaban. Me quedé mirándola con la boca abierta como una loser hasta que ella se dio cuenta y me dio mucha pena. 3. Ir al Content Studio de Maybelline Tener la oportunidad de ir al Content Studio de Maybelline en NY fue increíble! Pudimos ver varios de los estudios donde graban varias cosas y además conocer los nuevos productos que van a llegar a Colombia pronto y me emocionó muchísimo. 4. Tener 30 fotógrafos tomándome fotos El título lo hace sonar como si hubiera sido algo muy cool, pero no, fui un oso. Estábamos corriendo con Aga a nuestra cita con Tresemmé porque íbamos tarde, haciendo esos pasos chistosos entre caminada y corrida, cuando vimos a una modelo que estaba cruzando la calle mientras muchos fotógrafos le tomaban fotos. Pensamos que debía ser muy famoso y por eso le estaban tomando tantas fotos y cruzamos después de ella pensando que los fotógrafos ya habían terminado, pero no, se voltearon las 30 (o 15 o 50) cámaras hacia nosotras. El pánico en nuestras caras y cuerpos debió ser lo más chistoso en esas cámaras. 5. Tener una campaña con Falabella Haber tenido la oportunidad de hacer una campaña con ellos para mi blog e Instagram fue un sueño! Son una marca tan grande y solo trabajan con los mejores, entonces poder trabajar con ellos fue increíble además las fotos son de mis favoritas de este viaje. 6. Conocer a Michelletakeaim en la calle So fan número uno de Michelletakeaim! Sus fotos siempre son parte de mis moodboards y amo su feed demasiado. Fue un amor cuando la paré para pedirle una foto y definitivamente afirmé porque soy su fan. 7. Tener mis piernas y pies en el Insta Story de Rocky Barnes por 3 segundos Sueno como una loser, pero me emocioné demasiado cuando pasó! En la pasarela de Cushnie et Ochs estaba sentada en la tercera fila y en la primera estaban Rocky, Caro Daur, Morgan Stewart y Marianna Hewitt. Cuando revisé los Insta Stories de Rocky esa noche me pude ver en uno! 8. Estar en la cena para los influenciadores de Tresemmé Me sentí como si estuviera en un sueño, todo era espectacular y parecía uno de los eventos a los que van las influenciadoras más grandes. La decoración era divina, las influenciadoras unos amores y la experiencia increíble! Además terminar la noche en el rooftop con la vista perfecta de Manhattan, con cocteles y postres fue lo mejor. 9. Pagar 7 dólares por un helado Siempre me acordaré de la vez que el señor de los helados me estafó cobrándome 7 dólares por un cono de helado con sprinkles. Quería una foto con un helado entonces cuando vi el carro de los helados a la salida de uno de los shows fui de una a preguntar cuanto costaban, el señor me da uno en la mano y ahí me dice que son siete dólares. El helado más caro de mi vida y ni siquiera estaba tan rico. Don't forget to follow me on Instagram and Facebook Until next time loves! If you do not want to cooperate with Shein , please tell me ! Hoping you can understand and respect my work ! I will come back to this place, its huge and open, and have really tall ceilings. Wait staff was also pretty good. Bartender was awesome and personable. I was really pleased with my party at venues in Chicago. Ha! I highly recommend these guys.